Nadia Isler is the Director of the SDG Lab in the Office of the Director General of the United Nations Office at Geneva (UNOG). Ms. Isler has a long career in international development with several years of field experience in bilateral cooperation and extensive experience in multilateral affairs with and outside of the UN system. She started her career with Médecins Sans Frontières and the Swiss Red Cross before joining the Swiss Agency for Development and Cooperation where she served for several years in Eastern Africa. Ms. Isler has extensive experience in working with a variety of different partners, including the private sector, especially in the field of public health where she spent many years in charge of programs to fight AIDS, TB and Malaria. 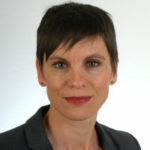 Ms. Isler then joined the Swiss Ministry of Foreign Affairs where she served as a Swiss diplomat for over 10 years, first as Deputy Head of development affairs at the Permanent Mission of Switzerland to the UN in New York, before leading on development affairs and the SDGs at the Swiss Mission to the UN in Geneva. Ms. Isler is a Swiss-British citizen and speaks French, English, German, Spanish and Portuguese.